I drafted this pattern for Baron Reinold Haldane to thank him for several woodworking projects he completed for me. 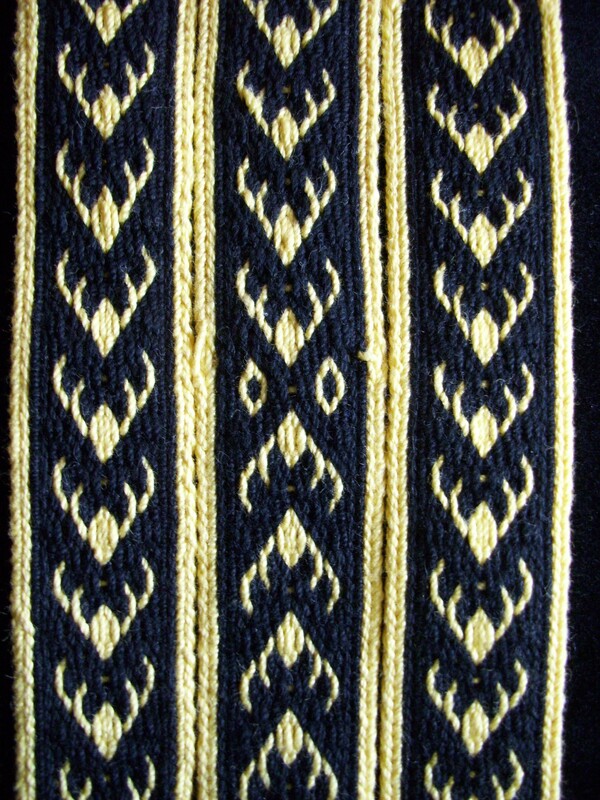 The pattern was inspired by his heraldry, which features golden stag horns. Baron Reinold has graciously allowed me to share his pattern. Thank you again, Bob! Examples of brocaded heraldic tablet woven trim can be found in Ecclesiastical Pomp & Aristocratic Circumstance: A Thousand Years of Brocaded Tabletwoven Bands by Nancy Spies. This antler pattern was originally designed for a fighting tunic and durability was my primary concern. Although there is only limited evidence for threaded-in patterns in early period, I chose this method of weaving because it has fewer long floats than brocade, and I felt it would hold up better to the abuse a fighting tunic can expect. 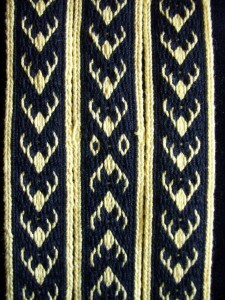 This is an intermediate tablet weaving pattern. You should be comfortable handling multiple packs of tablets on a single band, and be able to track frequent reversals. If you are new to tablet weaving I recommend starting with a more comprehensive tutorial before trying this pattern. Begin by threading 20 cards as per table below. Separate cards into three packs. It may help to mark the packs by using different colored weaving cards. For ease of weaving all cards should be the same size. Pack A = 1-4, 17-20. This is the border and sides, and should always turn forward (unless you reverse the entire pattern to unwind excess twist). Pack B = 5-6, 9-12, 15-16. This pack weaves the antler tips and the center of the band. Pack C = 7-8, 13-14. This pack weaves the inner part of the antlers. All cards in a pack should be turned at the same time. Pattern is consists of 8 quarter turns of the cards, and may be repeated or reversed as desired. Permission is granted to make and distribute verbatim copies of this document for non-commercial use provided the copyright notice and this permission notice are preserved on all copies. This is the recognized web site for the Barony of Allyshia of the Society for Creative Anachronism, Inc. and is maintained by the Allyshian Webminister. This site may contain electronic versions of the group's governing documents. Any discrepancies between the electronic version of any information on this site and the printed version that is available from the originating office will be decided in favor of the printed version. For information on using photographs, articles, or artwork from this web site, please contact the Webminister at webminister (at) allyshia (dot) westkingdom (dot) org. They will assist you in contacting the original creator of the piece. Please respect the legal rights of our contributors. © 2019 The Barony of Allyshia.